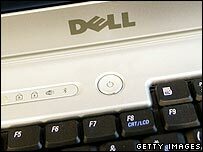 At least 7,000 jobs are set to be lost at computer firm Dell after it said it would cut its global workforce by 10%. 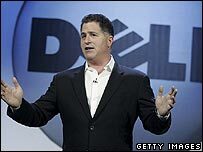 The PC maker has struggled with falling sales and rising costs, prompting founder Michael Dell to take direct charge of the firm earlier this year. Mr Dell said the job losses would be "difficult" but stressed they were critical if the firm was to deliver better value to customers. The US firm employs more than 78,700 staff worldwide. Dell has found life difficult in the face of falling PC costs and tough competition from the likes of a resurgent Hewlett Packard. In response, it has overhauled its management team and focused on improving technical support for customers and moving into fast-growing markets like China and Brazil. It recently started selling PCs through Wal-Mart stores in the US. Despite this, Dell said it needed to substantially reduce its workforce over the next year to remain competitive. As well as the US, Dell has significant operations in both Europe and Asia. It employs about 1,500 staff in Bracknell in the UK, where its European headquarters are based, and about 4,500 employees in Ireland. It said the scale of the cutbacks would vary across each region depending on current trading, and general business and legal considerations. "While reductions in headcount are always difficult for a company, we know these actions are critical to our ability to deliver unprecedented value to our customers," Mr Dell said. At the same time as announcing the job cuts, Dell actually reported a jump in first-quarter profits to $947m from $762m over the same period last year. It sales rose by about 1% to $14.6bn over the past three months. The news was announced after US stock markets had closed but Dell shares rose more than 2% in anticipation of it beating analysts forecasts.